It seems like every type of food is having a little moment to shine in the spotlight. Toast – it’s a thing. Or is it? Is Toast’s moment in the sun almost over? Are things like tater tots and cruffins taking over the spotlight? Regardless of its popularity (or lack thereof), Toast will always have a place in my heart. 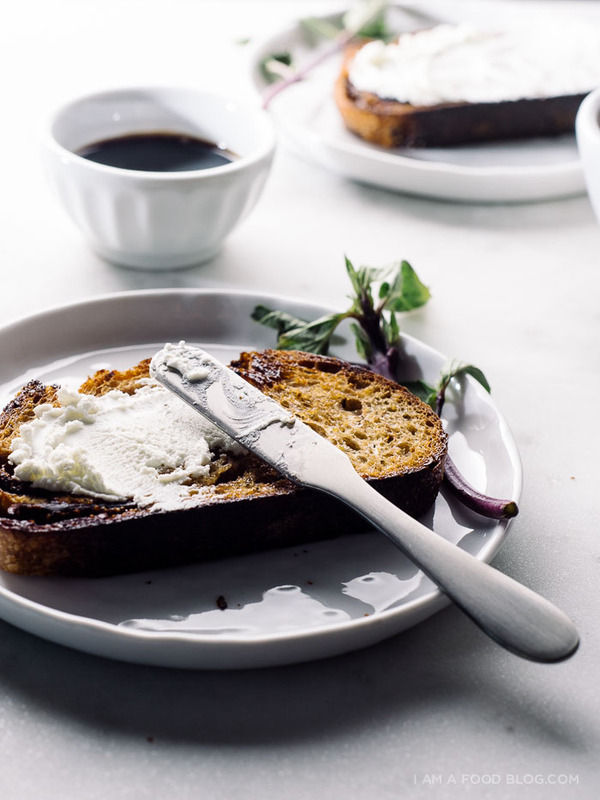 Even unadorned, Toast is delicious: the edges get crunchy and slightly caramelized, the golden brown outsides give way to soft and piping hot insides. When Toast is good, oh, it’s good. And as much as I like plain, I do play dress up every now and then. 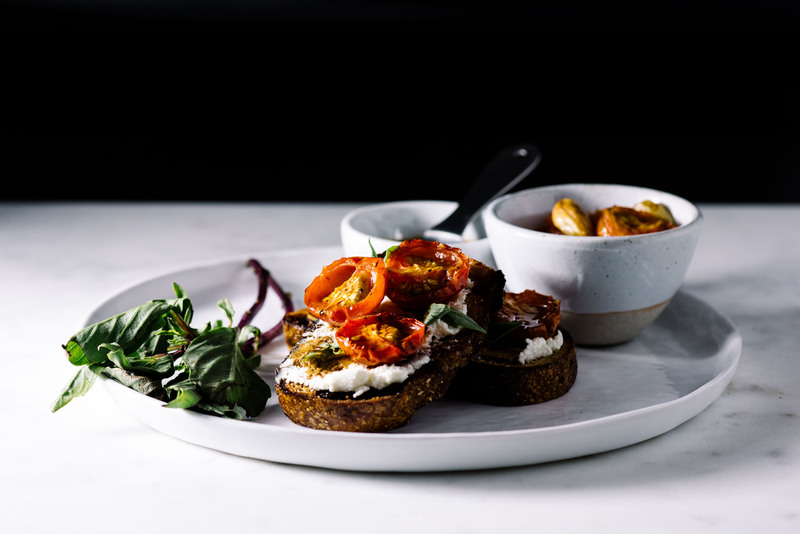 A bit of rich goat cheese, some roasted tomatoes, a drizzle of reduced balsamic and fresh basil is always a classic play. Are you a toast lover or a hater? Toast the bread. I like to toast mine up in a pan: drizzle a tiny bit of oil in a pan and heat over medium. Place the bread in the hot oil and toast, keeping an eye on it, until golden brown and crisp. Flip. 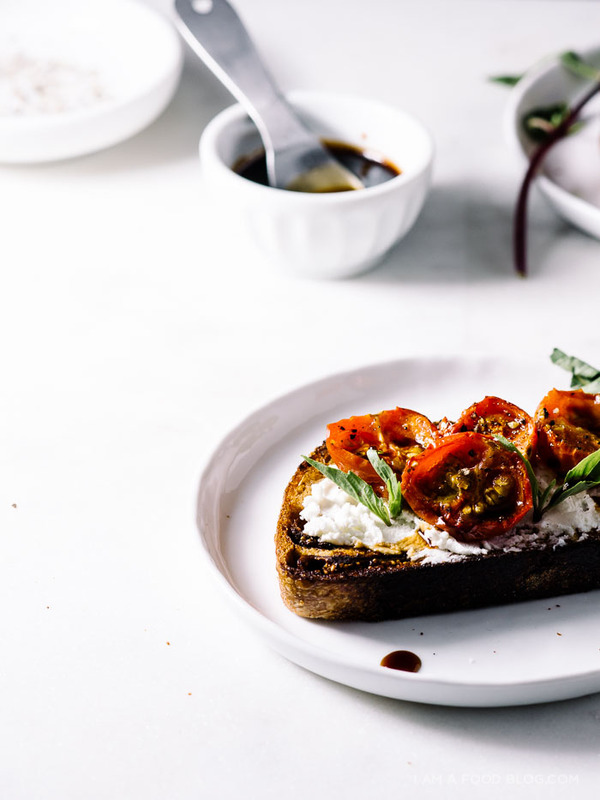 Spread the goat cheese on to the toast and top with balsamic, basil, a drizzle of oil, and salt and pepper to taste. Enjoy immediately! Preheat the oven to 400°F. 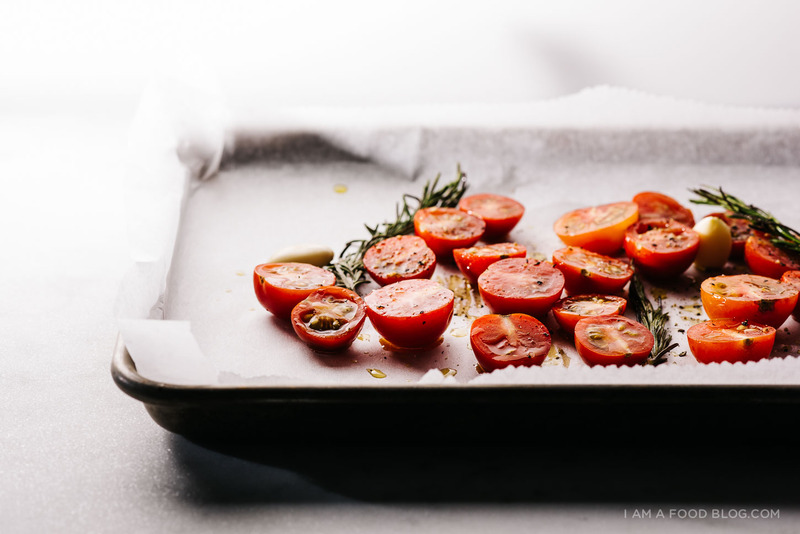 Toss the tomatoes, garlic, and herbs (if using) in a bit of oil and arrange on a lined rimmed baking sheet. Season generously with salt and pepper and roast for 20-25 minutes. SCREW TOAST. THE REAL STAR HERE IS THE GOAT CHEESE. I liked toasts before toasts were cool, and I will continue to like them when they are no longer cool. This variation looks especially tempting! I’m a toast lover, I can’t imagine why anyone wouldn’t be! Sometimes it’s the simplest recipes that are the most mind-blowing. This looks like a game changer. These fancy schmancy toasts look delicious, Stephanie! Hopefully toast will never be ‘out”, hahah. What’s a cruffin? Is that a croissant-muffin? I’m out of the loop and uncool. 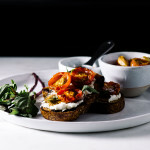 Anyhoo, roasted tomatoes are the business and toast will never go out of style! It’s made it this long, right? Toast will never go out of fashion for me! It’s always a quick vehicle to enjoy whatever you have laying around the fridge and are in a hurry! Although, I will be the first one to admit that those hurried toast lunches I make never look as beautiful at this! This would be a dinner for me. Lovely. With a glass of wine of course. Eating slow and easy and savoring! We have some lovely goat cheese making farms in my area too. New web design too—whoopee and adding some new features along the way. 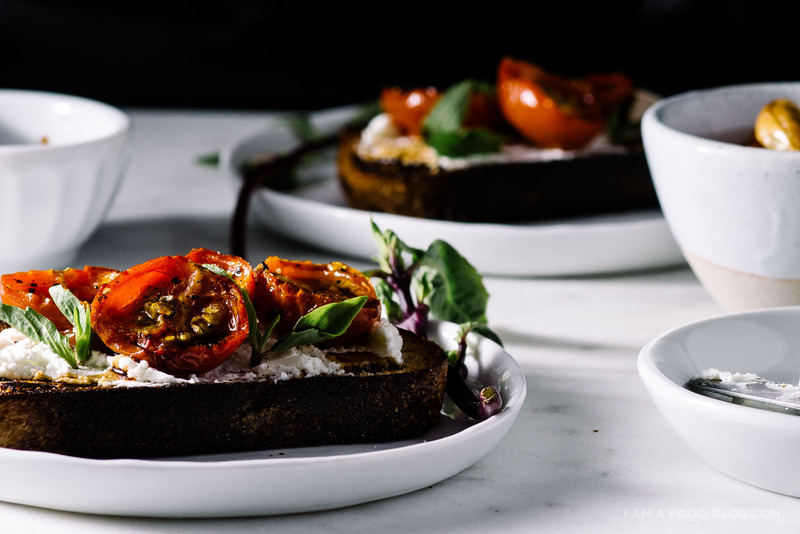 I’m generally fairly ambivalent about toast – in my mind it’s just a vehicle for whatever deliciousness you put on top and here you’ve managed to combine pretty much all of my favourite foods in one. I’m going to be eating this all summer long. Beautiful! I love goat’s cheese. I hope I’ll manage to make these toasts before I eat the whole cheese. That has hapenned in the past! DEFINITELY a toast person. I don’t care if their mainstream moment is up, those crispy babies will always have a place in my kitchen, especially if they’re slathered with cheese and tomatoes!!! Now all I need is for it to stay consistently above 50 degrees so I can plant my tomato seeds and then make this every day…c’mon spring! I AM SUCH A LOVER. A toast lover. A total, mega toast lover. I could go on and on for ages and days serenading the brilliance of toast, but instead I’ll just say this: Maybe when you and Alana and I meet IRL we can make cruffin Tater Tot TOAST. Just think about it. Until then, I’m gonna be noshing on this toast forever and ever. Those roasted tomatoes, gurl. YUM. 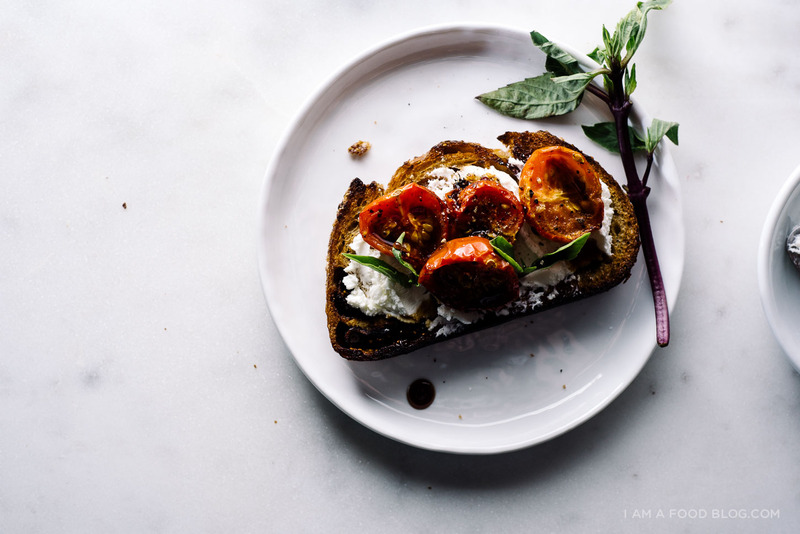 Toast is always a good idea…I need this now! Your pictures have me drooling! 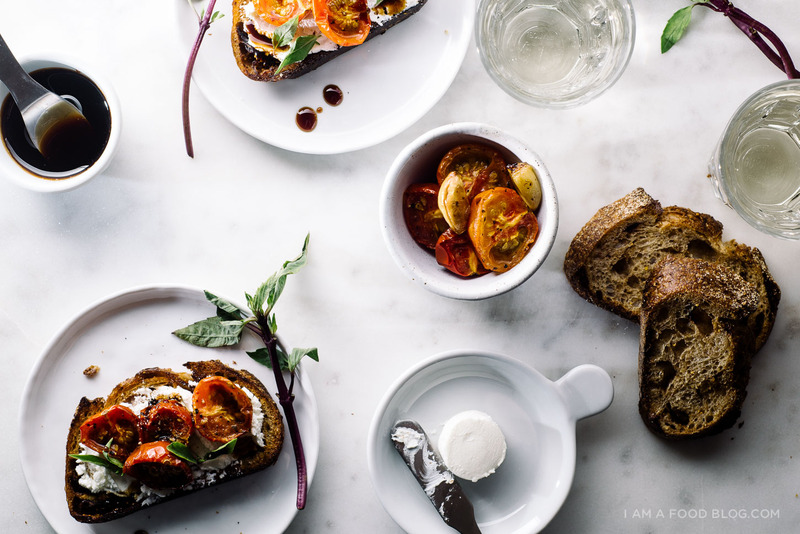 These toasts look so yummy! Once again, a gorgeous post. Once again, I want this in my belly now, please? This looks amazing. 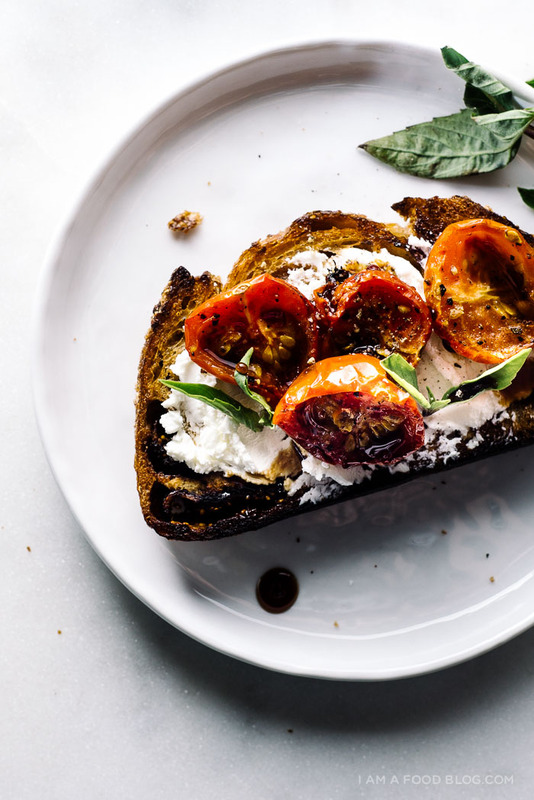 There are few things better than roasted tomatoes and toast. This sounds delicious and very easy to make. Can’t wait to give it a try. THESE toasts, Can I have a breakfast redo please so I can have these? Love the flavor combination, and the photos are just gorgeous! what a great idea to spruce up toast! & a great meatless monday option! A delicious combination! From the colors to the flavors everything clicks in this recipe. I would have to use gluten free bread (believe it or not there are some decent ones out there), but I think it would still be brilliant. The balsamic is good but I would always opt for a robust, fruity olive oil from Spain. So beautiful! I could literally just stare at your blog photos for AGES. You probably don’t want to give away your secrets… but HOW do you retain SO much detail in your huge photos with such a small file size to keep it loading quickly?! It’s truly, truly amazing!